We all know a bitter person and we think ‘I hope I never get like that,’ but do you know how to avoid becoming a bitter person? Bitterness can have serious consequences for your life. It drives others away, puts a barrier around your heart that keeps love out, and it gives you a negative perspective that makes you think that everyone is out to get you. A habit is a behavior that you engage in regularly, often without any conscious awareness of it. You are so used to acting this way that you do it automatically, without thinking. And that’s the problem. Habits that we are not aware of are usually negative. We suppress our feelings about our behavior because we disapprove of our actions on some level. We know that acting bitter is not pleasant to others, but complaining about past hurts is normal to a certain extent. We remember the things from our past that caused us pain and we continue to dwell on the past. A personality assessment tool called the Reminiscence Functions Scale was developed to look at how people recall their past experiences. One of the factors that was identified is called Bitterness Revival. Bitterness Revival is when people spend time thinking about memories of old injustices and bad times, rehashing lost opportunities. You might think that bitterness revival is something that older people would engage in more often, but research on this has shown that young adults are more likely to spend time thinking about bitter memories. Women also tend to score higher on bitterness than men do. Being jaded means not caring. When you just don’t care about others it makes you a sociopath. The funny thing about bitter people is that they clearly DO care about what happens to THEM, just not what happens to those who have hurt them. Unfortunately, a bitter person also tends to generalize their anger toward others who didn’t hurt them yet. The bitter person assumes that people are out to get them. For example, a man who has been through two previous divorces now sees all women as only wanting to hurt him. This distorted, jaded worldview now closes off the bitter person from being able to connect in a meaningful way with someone else. It also makes the bitter person more likely to lash out at others for their potential to cause them pain. Jealousy, envy, wishing for what you don’t have, whatever you want to call it, it’s unkind to others. You are basically saying ‘I hate that you have that because I want it.’ Jealousy is childish and it’s a habit of bitter people that you need to avoid. If you want something that someone else has, you can be happy for them having it, while still wanting it for yourself. Now take action to get whatever it is that you want and avoid becoming a bitter person. Forgive and forget is not a habit of bitter people. Instead, they keep a tally of all the things that you have done wrong and they will present you with a list of all the things that you have said or did when you have your next big argument. Don’t play this childish game either. When someone does something that you dislike, try to tell them right away that you prefer being treated differently next time. Otherwise, you come across as a bitter nag who can’t speak his mind. Someone who is bitter is likely to create a big scene, act melodramatic, and all but beg you to show them that they are the most important person in the world to you. No one needs this much drama. Please avoid this habit of bitter people. If you feel a need for attention, work silently and let your results make the noise. You will be seen and heard, we can almost guarantee it. Be honest with yourself; if someone you loved offered you a date at the opera, would you be excited and open to a new experience or would you tell them every reason you couldn’t, or didn’t want, to go? Focusing on the negative is limiting you to a tiny set of experiences that you could otherwise be having. Your life could be fuller right now if you were more open and positive about new experiences, change, setbacks, etc. 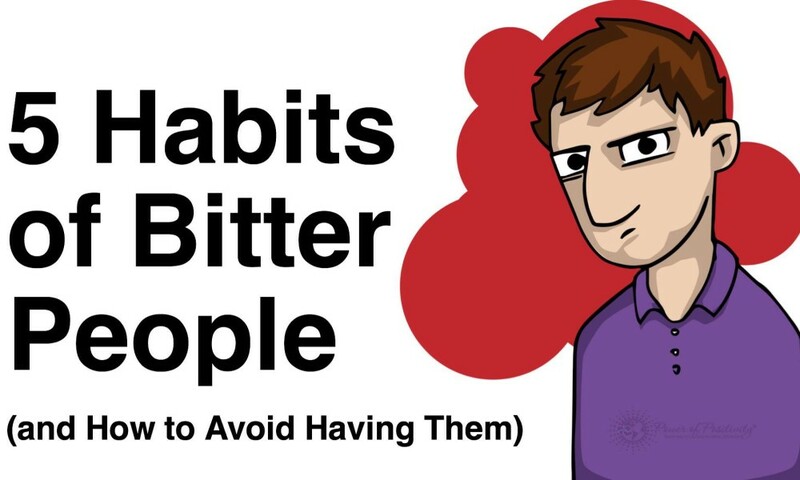 Don’t let yourself become a bitter person and avoid this bad habit. It’s the attitude, words and actions that you take on a daily basis that make up a personality trait like bitterness and choosing different habits is within your power to control.